This is our first exhibition of work by the accomplished ceramic artist, Connie Kiener. 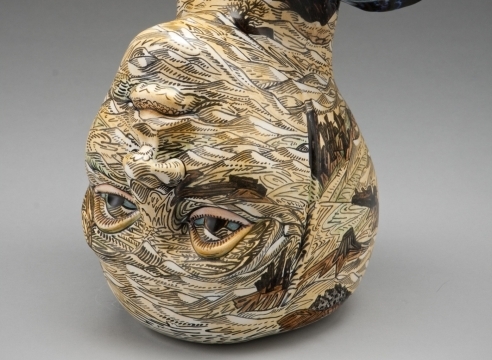 A Portland native, she has gained a national reputation as a ceramist, influenced by the Italian style of maiolica, she paints with unusual sensitivity on vessels, figurative forms, and wall mounted pieces. This exhibition will include her amazing platters as well as a series of scaled-down chairs and figures. Kiener’s inspiration comes from a broad vocabulary of imagery depicting flora and fauna, still life, cartography, landscape and portraiture. It is evident just how alive her imagination is through these beautifully painted creations. Her fanciful and enchanting renditions captivate a kind of lost innocence with authentic joy. Connie Kiener studied at the Pacific Northwest College of Art, the Chouinard Art Institute in Los Angeles, and in Umbria, Italy. She has exhibited in galleries across the country and has received several awards and commissions, including a project for the Oregon Convention Center in Portland. Her work is in numerous public and private collections, including the Smithsonian Institution, the White House in Washington, D.C., the Arizona State University Museum in Phoenix, and the Arkansas Decorative Arts Museum in Little Rock.